Almighty God, who didst call thy servant Oscar Romero to be a voice for the voiceless poor, and to give his life as a seed of freedom and a sign of hope: Grant that, inspired by his sacrifice and the example of the martyrs of El Salvador, we may without fear or favor witness to thy Word who abideth, thy Word who is Life, even Jesus Christ our Lord, to whom, with thee and the Holy Spirit, be praise and glory now and for ever. Amen. Almighty God, you called your servant Oscar Romero to be a voice for the voiceless poor, and to give his life as a seed of freedom and a sign of hope: Grant that, inspired by his sacrifice and the example of the martyrs of El Salvador, we may without fear or favor witness to your Word who abides, your Word who is Life, even Jesus Christ our Lord, to whom, with you and the Holy Spirit, be praise and glory now and for ever. Amen. This commemoration appears in A Great Cloud of Witnesses. 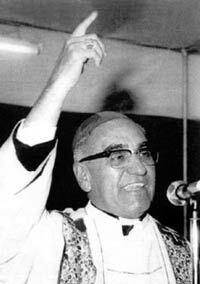 Óscar Arnulfo Romero y Galdámez (August 15, 1917 – March 24, 1980), commonly known as Monseñor Romero, was a priest of the Roman Catholic Church in El Salvador. He later became prelate archbishop of San Salvador. As an archbishop, he witnessed numerous violations of human rights and began a ministry speaking out on behalf of the poor and victims of the country's civil war. His brand of political activism was denounced by the hierarchy of the Roman Catholic Church and the government of El Salvador. In 1980, he was assassinated by gunshot while consecrating the Eucharist during mass. His death finally provoked international outcry for human rights reform in El Salvador. In 1997, a cause for beatification and canonization into sainthood was opened for Romero and Pope John Paul II bestowed upon him the title of Servant of God. The process continues. He is considered the unofficial patron saint of the Americas and El Salvador and is often referred to as "San Romero" in El Salvador. Outside of Catholicism Romero is honored by other religious denominations of Christendom, like the Church of England through its Common Worship. He is one of the ten 20th-century martyrs from across the world who are depicted in statues above the Great West Door of Westminster Abbey, London. Also commemorated on this day are three Maryknoll nuns and a woman lay missionary killed by a Salvadoran army death squad on 2 Dec, 1980, and additionally six Jesuits, their housekeeper and her daughter, who were also murdered by the Salvadoran army on 16 Nov. 1989.